Please note that the content of this book primarily consists of articles available from Wikipedia or other free sources online. 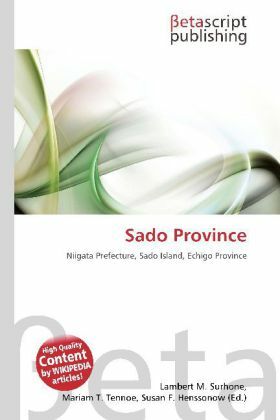 Sado was a province of Japan until the late 19th century; since then, it has been a part of Niigata Prefecture. It lies on the eponymous Sado Island, off the coast of Niigata Prefecture (or in the past, Echigo Province). Sado was one of Japan''s more remote areas, and nobles and aristocrats were often exiled to Sado when out of favor. People were also sent to mine silver and gold there. In the Kamakura Period, the province was granted to the Honma clan from Honsh , and they continued to dominate Sado until 1589, when Uesugi Kagekatsu of Echigo Province took over the island. The Tokugawa shoguns later made Sado a personal fief after Sekigahara, and assumed direct control of its mines.